Britain’s Prime Minister Theresa May listens as opposition Labour party leader Jeremy Corbyn responds to her statement in the House of Commons on Brexit in London on July 9, 2018. British Prime Minister Theresa May is scrambling for her political life after a day of high drama that saw three cabinet ministers resign, her Brexit strategy unravel and questions mount about her continued leadership. The drama started around midnight Sunday with the sudden resignation of David Davis, the Secretary of State for Exiting the European Union who had been leading the government’s Brexit talks with the EU. In a letter to Ms. May, Mr. Davis said he could no longer support her Brexit strategy, calling parts of it “illusory.” Steve Baker, a junior cabinet minister in the Brexit department, quit Monday morning and then hours later Ms. May was dealt an even bigger blow with the resignation of Foreign Secretary Boris Johnson. Mr. Johnson and Mr. Davis were strong Brexit backers and their resignations left Ms. May facing a growing revolt within her Conservative Party caucus, which is bitterly divided between those who favor a hard Brexit and a complete break with the EU, and those who want the country to keep some economic ties to the EU, including remaining in the customs union. Under party rules, 48 of the Conservative’s 317 Members of Parliament can force a vote of confidence in the leader, and there were indications Monday that several MPs have submitted letters calling for a vote. Mr. Johnson is considered a leading candidate to replace Ms. May, although it’s unclear if he would win favor among the majority of MPs who do not support his idea of a hard Brexit. The political turmoil comes at a critical time for Ms. May. The U.K. is set to leave the EU next March, and both sides have been locked in negotiations about the terms of the country’s departure and an agreement on the future relationship. The EU has said a deal must be reached by October to give EU member states enough time for ratification. The customs union has emerged as a key issue in the talks because it allows for the free movement of goods. Under the EU’s customs union there are no tariffs on goods that move among member states but all members must charge the same tariffs on imports from outside the bloc. U.K. business groups have said that remaining in the customs union would give them more certainty and better access to the EU. Staying in the customs union would also ensure that there was no hard border between Ireland and Northern Ireland, something the EU and U.K. have agreed is essential. However, Brexit backers oppose the customs union because it would mean staying aligned to EU regulations and it wouldn’t allow the U.K. to charge its own tariffs or develop its own trade policy. On Friday, Ms. May thought she’d finally reached a consensus with a plan that included a “customs arrangement.” The plan, which will be fully outlined later this week, would ensure the free flow of goods between the U.K. and the EU but also permit the U.K. to set and collect its own tariffs. The U.K. would collect EU tariffs on goods moving through Britain to the EU, and turn over the money to Brussels, and it would remain largely aligned with EU regulations. 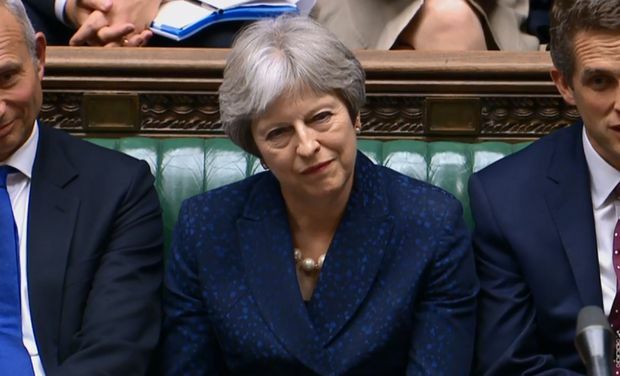 Ms. May hailed the plan as a sensible approach to Brexit that fulfilled the country’s objective of leaving the EU without damaging the economy. She also demanded on Friday that all cabinet ministers support the plan or resign. Ms. May’s plan “is not really leaving the European Union,” said Jacob Rees-Mogg, a Tory MP who leads the European Research Group, a collection of MPs that strongly support Brexit. “She has advanced backwards. She has advanced not to have Brexit.” But Ms. May also won strong support from many Tories who backed her vision for a softer Brexit. However, other experts said Ms. May could survive the revolt because most Tory MPs support a softer Brexit. Ms. May has also won the backing two other key Brexiteers: Environment Minister Michael Gove and Dominic Raab, who replaced Mr. Davis as Brexit minister. Editor’s note: An earlier version of this article incorrectly spelled Dominic Raab’s surname. This version has been corrected.